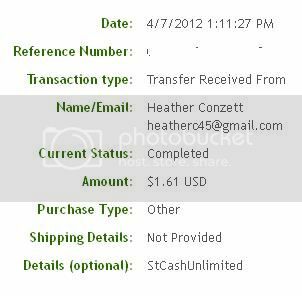 1 st StCashUnlimited payment proof. - Received 64 days after requesting, full bal. - Average: 3,8¢ / day. Didn't click all days. > Minimum payment is $1.00. 1 st prova de pagamento de StCashUnlimited. - Recebido 64 dias após requerer. - Média: 3,8¢ por dia. Não cliquei todos os dias. - $2,50 - 0,49 PayPal fee. - Received 63 days after requesting. > Minimum payment is $1.00 and the maximum is $2,50 by now. 2º prova de pagamento de StCashUnlimited. - Recebido 63 dias após requerer. - $2,50 - 0,49 PayPal fee = $2,01. - Requested 13 Nov; received 25 Dec.
3º prova de pagamento de StCashUnlimited. - Recebido 42 dias após requerer. - $2,46 - 0,48 PayPal fee = $1,98. - Requested 25 Dec; received 04 Feb.
> Points cannot be converted to cash by now. 4º prova de pagamento de StCashUnlimited. - Recebido 40 dias após requerer. - Requested 04 Feb; received 17 Mar. > Points can be converted to cash (again). 5º prova de pagamento de StCashUnlimited. - Recebido 43 dias após requerer. - Requested 21 Mar; received 04 May. 6º prova de pagamento de StCashUnlimited. - Recebido 44 dias após requerer. - Requested 05 May; received 26 May.